(Android - For most Android based phones and tablets. (iOS - For most iPad, iPhone, and iPod Touch devices. Ah, Grumpy Cat. It was only a matter of time before you got your own mobile game. That time was actually last year, but that's neither here nor there. 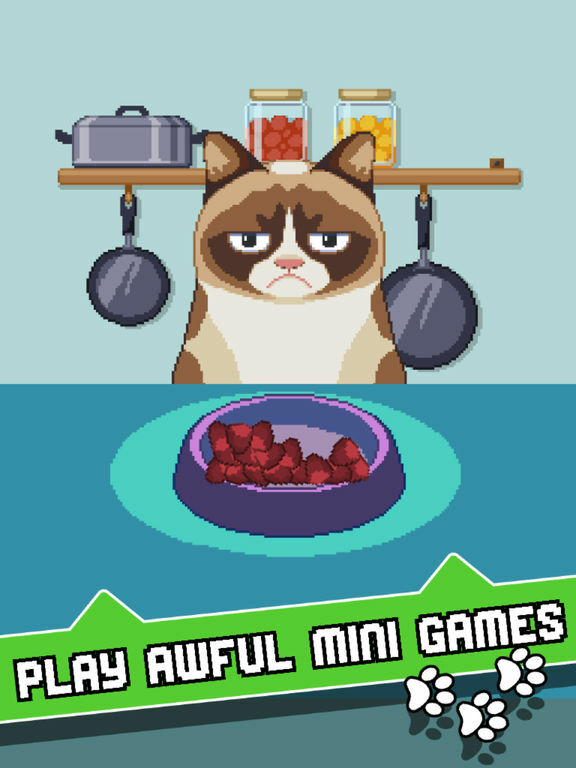 The point is Grumpy Cat's Worst Game Ever is a thing that exists and it's actually a pretty solid collection of microgames. There are a lot of games on offer, so we won't be covering all of them, but there are some general pointers worth keeping in mind. Shake your stickers. Sometimes the stickers you've unlocked will spit out coins if you shake them. Might as well do it every now and then, just in case. Check the Daily Mission. Daily Missions are basic score challenges that focus on a single microgame. They're a good way to earn a few extra coins, as well as familiarize yourself with games you might not have unlocked yet. Where you are determines the stickers you get. For example, if you're in the Garden and go to use the claw machine thing, you'll get stickers for the Garden. Your coins aren't tied to a location, however, so you could play a bunch of games in one area, then move to another to unlock stickers from a different set if you want to. Work fast. Each game is on a timer, and those timers get shorter the longer you last. You'll have a little time when first starting out to get used to some of the games, but once it starts moving you won't have that luxury. Pay attention to the prompts. Right as a game starts you'll be given a short blurb about what you have to do (hit the rats, catch the dot, etc). 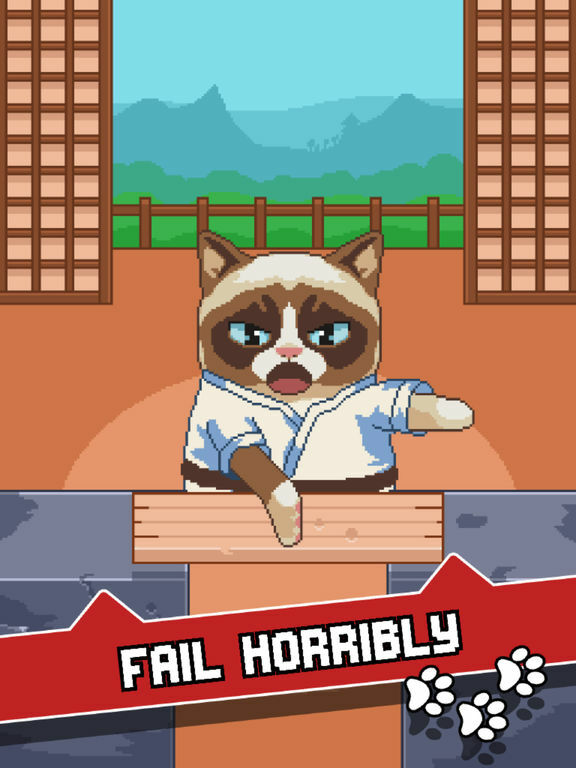 I was genuinely surprised by how much fun I had with Grumpy Cat's Worst Game Ever. Not that I was taking the name at face value, but truth be told I wasn't expecting a whole lot from a free game based on an internet meme. Turns out it pulls from a great source, and does so quite adeptly. I know the idea of 'microgames' has been around for years, and it's more of a genre at this point, but I can't avoid thinking of WarioWare when I'm playing Grumpy Cat's Worst Game Ever. It's not just the short mini-games, though - it's also stuff like how everything speeds up every time three microgames pass, the steady trickle of new microgames that get added to the mix as you unlock them, and so on. I don't think this comparison is a bad one, mind you. There are a lot of microgames in Grumpy Cat's Worst Game Ever, and while they all have very simplistic (sometimes similar) control schemes, they can still be quite tough. Especially as things begin to move faster and faster, and some of the games get tougher by adding more objects to remove or symbols to match or whatever. It's a very simple concept, as has been the case since the Gameboy Advance days, but simple doesn't mean easy. It actually becomes quite tough, really darn frantic, and is a lot of fun. A surprising amount has been done with Grumpy Cat as well. The kind of meme-fodder you'd likely expect is here, but thankfully it takes a backseat most of the time. Instead we're given a bunch of different scenarios and animations of Grumpy Cat doing goofy stuff - stuff like trying to catch a laser dot or acting as a weird Q-Bert/Easter Bunny hybrid. They aren't all chuckle-worthy, but the animations and situations are inoffensive at worst. Some of them did elicit a smile though, I will admit. Variety is Grumpy Cat's Worst Game Ever's strong suit. There are, as I've said, a lot of microgames to find. What's great about this is how there are several ways to either try out or unlock new ones, which of course gives players more excuses to keep at it. Daily Missions are basic score challenges that center around a specific game, but if you haven't unlocked that game yet it's a good way to try it out. Remix is another good way to stumble upon new stuff you might not have seen yet, and it's the primary means of competing with other players for high scores as well. You can also spend the coins you earn and save up by playing to randomly draw a Grumpy Cat 'sticker,' which will unlock a new game for your regular rotation. No I do like unlocking more games, but I'm honestly not a fan of the sticker system. Specifically I feel like the ability to move them and the need to occasionally shake them for coins is rather weak. Sometimes they get behind the menu buttons, it's tough to tell when you can shake coins out, and overall it's just a pointless distraction. 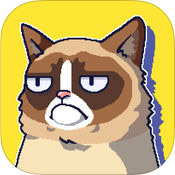 The various 'types' of Grumpy Cat can be amusing, but I don't think this needed to be front and center on the game screen - maybe more of a sticker collection book or something, I dunno. As you'd expect, not all of the game are winners, either. I haven't found one that I'd consider bad as of yet, but there are definitely a few that I've gotten tired of seeing. Especially the whack-a-mole style one. Though with such a large assortment it does make sense that they aren't all winners. The biggest annoyance I've run into is the use of video ads (surprise, surprise). I don't mind that they're present, as this is a free-to-play game, but they tend to be unavoidable. Like, I'll run out of tries after going through a slew of microgames, then I'm given the choice of quitting or watching a video to continue with one last attempt. This is fine. What's less fine is how most of the time I still end up having to watch a video ad when I opt to quit rather than continue. If there's going to be a video ad either way then why even give players the option? I think most would be hard-pressed not to like Grumpy Cat's Worst Game Ever. It's nothing new, sure, but it's funny and kind of adorable, full of unlockable content, and as tough as it is simple to play. It's also fun. That's kind of important.